I love all of your anthologies, and Rogues surely deserves the recognition. I know that you're very busy, but I hope someday we see more of your own short fiction in anthologies. As much as I love Westeros, I think Tuf Voyaging is one of my favorite things ever. Do you have any plans to return to Tuf in the far future, once Game of Thrones et al is finished? I do have ideas for more Tuf stories, and even a novel... but where will I ever find the time to write them? GEORGE I AM READING ALL OF YOUR OLD BOOKS. MY HUSBAND WAS YOUR BIGGEST FAN. SADLY HE PASSED AROUND THE TIME YOUR LATEST BOOK IN THE SERIES CAME OUT. IT WAS ON ORDER BUT SADLY HE NEVER GOT TO READ IT. I AM EMAILING TO SAY YOU ARE A FABULOUS WRITER AND SO GRACIUS TO ALL YOUR FANS. Delegate them :) Find a promising young writer (or writers), put them under contract, entrust your notes to them, and edit the stories. I know that sharing such high quality toys must be painful to consider, but you've edited a Jack Vance tribute anothology in the Dying Earth universe, so why not a George R.R. Martin tribute anthology set in Tuf's universe? Alternately, you could solicit "original" Tuf stories. To be clear, I would prefer for A Song of Ice and Fire to wrap up sometime in the next few years so that you can move on to more Tuf, but as the Rolling Stones put it, "You can't always get what you want." In fact, I'm 99% certain that this is purely wishful thinking on my part. I think your plate is already overflowing, and throwing another drape on Son of Kong's shoulders wouldn't do you any favors. "Daemon gave us these cloaks, and they're gold no matter how you turn them"
I loved reading about Daemon's stepstone kingdom! Congratulations George! Worth noting that not a *single* candidate from either Puppy slate made it to any of the Locus finalists, despite it being a more open vote system. Clearly this means that the anti-puppy conspiracy is far more insidious than ever thought, and like with any good conspiracy, a complete lack of evidence is incontrovertible proof of the conspiracy. Oh cool. Congratulations to Scott. I think the Locus Awards have far more sensible categories at the moment. Not saying the Hugos should change their categories willy-nilly, but the Locus Awards just make more sense to me, as lists of what to read/keep an eye out for. Especially just having one 'magazine' category. Edited to add: and congratulations of course! 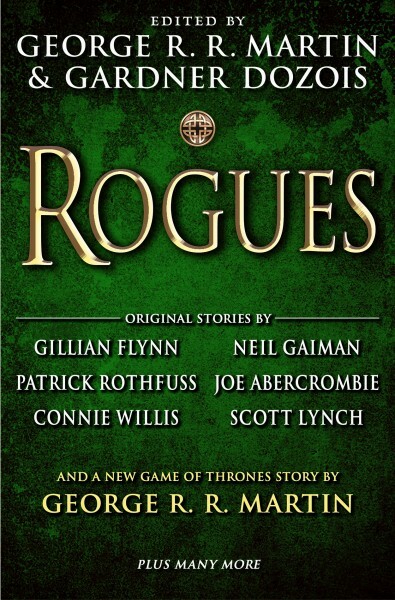 I loved the Rogues anthology, bought in on my Kindle recently, and thought it was a lot of fun/mayhem. I like the separate categories for SF and Fantasy novels. Since I mostly read novels, and very little shorter fiction, the structure of the Hugos where there's one award for novels and several for shorter forms, is less satisfying. I wonder if that structure is an artifact of the days when more of the action in SF&F was in shorter forms. Or it could be that the field hasn't changed but my preferences simply have. Biggest surprise to me in the Locus awards was that the Abercrombie was listed as YA. I don't dispute that characterization--now that I think about it, it was a young-man-coming-of-age story--but when I read it and its even better sequel it simply didn't occur to me that I was reading YA. Speaking of things outside of A Song of Ice and Fire, will there ever be a sequel to Fevre Dream? I know you are very busy with TWOW and all of that, but a sequel to Fevre Dream is something that I've dreamed about for years. I do have an idea for a FEVRE DREAM sequel. Again, the issue is finding the time to write it. How good is Fevre dream? I was thinking of reading it, or re-reading ASOIF until the next book comes out! It's obviously going to be a matter of taste, but I loved Fevre Dream. It's a different kind of story than ASOIF, though. I'd call it "historical fantasy". It's set in the age of steamer ships on US rivers, and I'm not a historian, but it "feels" very well-researched and historically accurate. If you're a fan of steamers or that era in general, I think you'll really enjoy it. If you hated Huck Finn because they spent too much time on the river, then Fevre Dream might not be for you. I would also suggest The Armageddon Rag, but I would suggest reading it in a specific way: Each chapter of the book quotes one (or more) classic songs. All of the songs are available on iTunes, so at the beginning of each chapter, I would download the music, listen to it, and then read the chapter. Listening to the music really helped the book "click" with me. I'd love to see a multimedia edition of the book that would come with all of the music in a bundle, but that would probably be a copyright nightmare, and I think GRRM already went through one of those when he wrote the book in the first place. It's excellent. Fevre Dream was the first non-ASOIAF book of GRRM's that I read. It lived up to my expectations and then some. I think my favorite is Windhaven, though. I too wish you would do more non-GOT writing! My favorite work of yours, in fact, is "Fevre Dream," which is in my opinion on of the very best vampire novels ever written! (To be honest, I don't like GOT very much, and I would be happy if you gave all the people bugging you about finishing it a finger in the eye and went to writing all kinds of other things :) ). I also wanted to say how much I have appreciated your writing on the Hugo stuff as well. Gratz on the anthology! Re: Love your non-GOT stuff! I agree! Fevre Dream is wonderful and so is Tuf Voyaging. I loved GOT which I read when it first came out, but not my favourite. Still, if it gets you more sales on the other stuff, excellent. Congratulations! And for the benefit of your UK fans who might have missed 'Rogues' Amazon has the kindle version for £1.48, around $2 for those unaccustomed to our currency. Well - at least there is overlap in the Novels category - 3 Locus nominations (1 from Fantasy, two from SF) are also on the Hugo ballot. don't see any overlap anywhere else, though. Having just completed Vermilion by Molly Tanzer (ballot worthy) I was out of compelling reading material. So I attempted to do my part to support the Hugos. It wasn't much...Hah! I read exclusively on 'devices' now (I can set the font on HUGE and avoid donning reading glasses). B&N and Amazon both provide 'free' samples of most e-books I care to read. I make good use of the service. I downloaded and read the free sample of Goblin Emperor. I felt awash in smooth, flowing prose. The writing was lovely, the characters succinct and Maia was endearing. I didn't however get the feeling that my gobbo fantasies of bomb-lobbing, Warg-wrestling miscreants were going to be realized in this story. I searched out reviews which confirmed my suspicions. I didn't purchase it. It is on my long list in case I run out of material, but mostly it's a bit too contemplative for my lacking attention span. I downloaded and attempted to read the free sample for Three Body Problem but only read about 5 pages. I just couldn't find any reason to read further. It seemed like a solid well-written story, just not my kind of thing. TOO realistic perhaps. It was hard on the empathy synapse in my brain. Obviously I didn't purchase it. From the little bit I rad the two stories seemed like polar opposites in style. One made me feel languorous the other unsettled. I then saw this post which prompted me to download and read Rogues free sample. I had, of course, seen this book around but short stories don't usually make the cut for me. This time when I ran out of'free' content I was left hanging onto a mysterious package that had been passed through half-a-dozen new acquaintances in the streets of Sipani. I only hope I see some of these characters in future Lord Grimdark stories. I bought the book. Gillian Flynn's story was up next. It was good. She's an author I probably wouldn't have sought out as a stand-alone, but man she packed a lot into that little story. Tonight after work, I indulge in more words written by Rothfuss (absorbed slowly and with regard). So to sum things up. I'm not in fandom. I'm purely a consumer. I'm not voting in the Hugos. I had contemplated joining but it seemed disingenuous to join and vote simply due to political controversy. I only followed this whole thing out of morbid curiosity after witnessing gamergate attack the indie gaming community (Then I kinda got hooked on Not A Blog). I trust that those who are invested in producing good quality literature will continue to recognize and reward the talents and successes of their own. I respect those opinions. The Hugo and/or Nebula seal on a book was a tool I used heavily for years to help me find good books at the book store. But that was once upon a time when a book cover was the first thing that caused me to pick up a book. With e-books the cover is typically just a poorly adapted, memory-hogging graphic that I hardly notice. I do intend to check out the other Hugo Nominations for best novel. I've downloaded the 'free samples' for all of them. The Ancillary series has been on my watch list for awhile now. As to the Hugo's themselves, another suggestion to head off the slate-voting mess that this year's awards have suffered under could be making Worldcon voting more exclusive rather than more inclusive. Limit membership and voting rights to those who are vetted through some sort of an application process that seeks qualifications in writing/critiquing/creating sci-fi literature. CONGRATS on the Locus nomination for Rogues! The Gillian Flynn story was my "gateway drug" into Gone Girl. I'd resisted reading it for years, but after I read that story, I knew I had to read her book next. Pleased to see some Aussies there - Garth Nix, Jonathan Strachan and Shaun Tan. I'm curious, in your profession, I'm sure many people push books-to-read on you...with all your projects and time constraints, how do you pick a book to read? I'm sure you read books based on recommendations...thats what I do. There is so much out there and so little time, so I base what I read off recommendations. Be well. "Sometimes we live no particular way but our own..."
Yes, I get books sent to me every week... most of them fantasy novels looking for blurbs. Some SF too, though not so much. Histories and historical fiction and mainstream novels and mysteries I buy for myself. As to which ones I need... hell, hard to say. Whichever one catches my fantasy. I must confess, I start a lot of books I never finish. Read the first couple of chapters, put them down, never feel the urge to pick them up again.